yep, it's the daily spice apron by heather bailey in jewel mentioned in my previous post. lovin' it so far and the pattern appears to be very well written. if i can steal a few more quiet moments from the business of life, i'll start to sew! and i hope you guys don't mind something not sewing related. 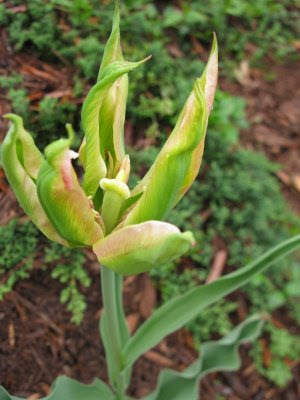 it's the first tulip to open that i planted late fall and i'm sooooooo excited! sadly i didn't make note of the variety. oh well. i'm happy to have something pretty to look at regardless of name. there are at least a half dozen more in bud. can't wait! That fabric looks yummy and tulips - SPring just may really be here! love the fabric your using. And Tulips are one of my fav flower. It is so wonderful when they start coming up. Flowers are always nice. Can't have them in the house because the cats eats them and then... gets rid of them, if you get my drift. And I think you do. Tulips really mean spring is here! I love that fabric you are using! okay. surprise visits from ANYTHING that pops out of the yarn. well. that is just PHENOMENAL !!! hahaha. you know i meant to say GROUND. Pretty fabric! That will be be a pretty apron. :) The flower is also so pretty. It is nice to see signs of spring! Tulips are my very favorite of all flowers but I've never seen one like that! It is gorgeous, I mean gorgeous! If you do find out the name of it, please let us know! And that apron is going to be the coolest apron ever. I can't wait to see it! I know what you mean about getting away for a little time to do some things you want. But life is busy and life has its ups and downs and life is good!!! I always seem to miss it when you post, it's always a few days later and then I realize you snuck one by me! Your project seems to be coming along nicely! Love that fabric, so fun. I really liked this apron when I was searching for aprons. 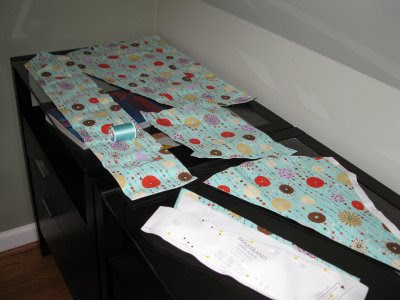 I'm going to make my mother in law an apron for Mother's Day, but I think I might use the half apron pattern I made for myself and tweak it a lot. Aprons are so much fun to make, you were definitly right by saying that are addicting! That tulip is so pretty, I believe it's a parrot tulip if anyone is wondering. Love these beautiful signs that spring is here and summer is right around the corner! oh, that flower! so pretty. i can not wait to see your apron. i know it will be great.